Kiddush Club in the news! Yasher Koach to all IKC members! LET'S ROUND IT UP TO 5 ZEROS! It may have been a while . . .
since your last convention, but the IKC is still active and looking forward to our next event in July of 2019, on the waterfront, in Toronto, Canada, home of the first IKC convention! You'll be hearing more about the IKC and the FJMC Convention in the next weeks, but first, we'd like to ask you for your assistance. As leaders of the FJMC, we have taken on a challenge to reinvigorate the Heneni/Century Club/FJMC100 which now be known as "Friends of the FJMC". The funds raised will go towards the programming of the FJMC and we encourage everyone to stand with us and answer the call today, by proclaiming "Heneni". As Friends of the International Kiddush Club, your monthly donation will help the FJMC to continue to provide the outstanding quality programming and initiatives that we all know and promote in it's clubs and regions. Please consider making an automatic donation. It's easy to do, and if we reach certain goals, matching donations "kick in" to double the effect. Recommended amounts for the monthly donation start at just $18, but you can make yours for any amount. If you'rd rather make one contribution each year, just specify "Friends" when you donate and you're one of us. Please talk to your fellow brothers and sisters to join us in answering this call and we truly appreciate your help in helping the FJMC to achieve it's goals. All donors will be listed on the special "Friends of the FJMC" page on the FJMC website. My name is Eden Glasman and I work for Noam, the youth movement for Masorti Judaism. We are based in north London, UK. My four colleagues and I work on projects such as summer and winter camps, Israel tour and gap year, educational trips to Europe, weekly leadership training and community work in Masorti synagogues. Rabbi Daniella Kolodny was kind enough to pass on two sets of tefillin, received by Rabbi Chaim Weiner, to us. We are extremely grateful. Owning our own tefillin means being able to actively encourage our young people to lay them. Most of our members' experience of tefillin is glimpsing older members use them in synagogue without really understanding what they are about. Having our own sets means giving them a sense of ownership over the prayer process and closer engagement with tradition. We are an egalitarian movement and want both our male and female members to be Jewishly literate and knowledgeable in Halacha. As part of the process of engaging young people more closely with Jewish practices, we are undertaking learning from Masorti Rabbis in different Halachot. After carrying them out for set periods of time we write blog posts to share with the wider movement. Our next Halachic undertaking will be the daily laying of tefillin at the beginning of our working day for two weeks. Now that we have some, we can begin this process, and can pass on the knowledge gained to younger members - starting with our upcoming summer event in north Wales involving around 450 young people. On behalf of all my colleagues I would like to thank you for this gift and opportunity. We hope that the mitzvah of laying tefillin will be carried out by many people in many different places for years to come! On Wednesday, February 20, 2013, Allan Gottesman (#5), Mike Perloff, Rabbi Bob Golub, Executive Director, MERCAZ-USA and I (#1) traveled to the Israeli Embassy in Washington, DC to meet with Noam Katz, Minister of Public Diplomacy and Miriam Katz, Director of National Initiatives, Public Diplomacy, to talk about funding for the next series of Israel Advocacy seminars that we have been running with MERCAZ-USA and MERCAZ-Canada. We talked about a number of items, and worked on plans for the next series, which we think will be in South Florida, San Francisco and New England. Right now we have funding for the first 2 and once the Israeli government is formed, We expect the funding will be "green-lighted" to continue the series. We talked about expanding the programme to other groups and going to ARZA (Reform Zionist) and RZA (Orthodox Zionist) among other Zionist groups. We have had some involvement of people outside of our Masorti community at the first 3 events, in particular Christian Zionists, and we all agreed that broadening the effort would be beneficial. The meeting was very productive and at the end, when Noam asked if there was anything else, I said, "yes, let's get some photos." So Noam and Miriam begin to line us up - no electronics are allowed inside the embassy so we had no camera or cell phones - and I said "Where's the ambassador?" 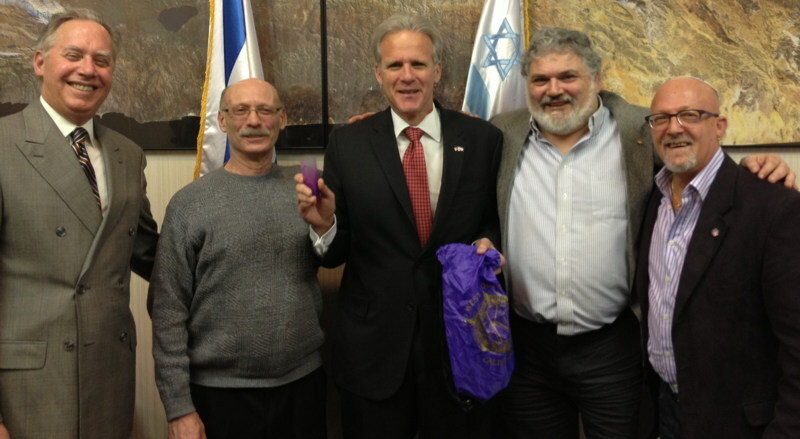 So Noam went out and brought back Ambassador Michael Oren. Quick introductions all round and then Allan Gottesman says "We have a presentation for you, these are the FJMC's Yom Hashoa Yellow Candles" and gives them to Mr Oren. He mentioned that he knew about the programme and took one in his hand for the first photo. We asked that he light it on Yom Hashoa, and a promise was made, and his assistant mentioned that it would be on the Ambassador's FaceBook page. He thought we were finished with him . . .
Allan says "We have another presentation, this one's from the International Kiddush Club" and we gave him an IKC Tallit bag, the IKC Kiddush Cup, the IKC Pin and a membership card, and wouldn't you know it, there was a small bottle of scotch inside the bag. At this point Mr Oren remarked, "Now you're talking, this is great!" and we took the second photo. We told him about our fundraising for the Tefillin Fund, about the article in the Times of Israel and our website. I think we made his day! Sometimes we have just too much fun doing this stuff. But it's all good. What we do; Our aim is to raise funds to purchase tefillin and mezuzot for those who cannot afford them in Latin America and other areas of the world. The same situation does not occur in the less affluent parts of the world and we are doing our best to raise money to help. In these areas, without large Jewish populations and Federations, the Jewish population can sometimes feel very isolated and ignored. To this date we have raised somehwere over $22,500 USD in our quest and have handed out hundreds of tefillin and hundreds of mezuzot. We are the fun raising and fund raising group, but we do not send the items ourselves. Please contact your local rabbi to see if he or she is able to help you. That's who we go through to distribute most of our items. We have also assisted the Masorti congregations in India by matching them to a donor who sent retired chumashim and siddurim to the congregations in Mumbai. If you'd like to sponsor a set of tefillin, e-mail us. 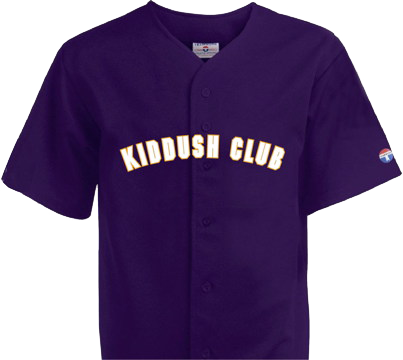 The Kiddush Club in the Jerusalem Post! NEWS! Chivas Brothers and Morrison Bowmore in Scotland and the U.S are strong supporters of the Jewish community. They have been in contact with us and assure us that they have worked to remove the boycott. They should not be boycotted. Loch Lomond Distillery Co. Ltd has responded and they are lobbying on our behalf. They should not be boycotted. Our lobbying efforts are working. Withe the help of these 3 firms and the publicity generated, the local council for Dundee voted down a boycott proposal by 22-2. The pressure is paying off, and the companies that are working with us are helping to persuade other councils that a boycott of Israel is not in their best interest. The 3 firms need to be applauded for their quick response and for their help. Again, the scotch should not be boycotted. Remember, it's not about the Scotch, it's now entirely about the Boycott of Israel and Israeli products by West Dunbartonshire Council. If you know of other products produced in West Dunbartonshire, let us know, we'll work with those firms to enlist them in our efforts. Scotland produces many fine items, and there is no need to tar the entire country with this yellow brush. As you may have heard or read, the West Dunbartonshire Council in Scotland has decided to participate in the BDS campaign (Boycott-Divestment-Sanctions) against Israel. No sense trying to figure out how these poor Scots have any connection to the situation, but they have decided to boycott Israeli products and to mark anything Israeli in their local shops with an identifier (probably a yellow star?) to warn people of the source of origin. Jameel Rashid, the author of the pro-Israeli blog "Muqata" suggests that we boycott the products that are best known to have their origins in West Dunbartonshire Council, Scotland, ie, Scotch Whisky from certain distilleries. We would suggest that if you are going to be writing to these poor dolts to complain about the boycott to do it very soon, because they might find out that their Intel based computers need to go out in the trash as the CPUs were developed and produced Israel, and that their Microsoft Windows operating system and their MS Office suites had heavy Israeli development. You won't be able to MSN them, nor Skype them, because those too were developed in Israel. We won't mention the other products (medicines, technology, etc) that are sole sourced from Israel, but suffice to say that those who are boycotting 100% will have short and unhappy lives. So e-mail them quickly, before they revert to painting themselves blue and hugging trees. If you live in Canada, you can't mail them, because the posties are going on strike tonight - not blamed on Israel, yet. Here's the contact info for the West Dunbartonshire Council: http://www.west-dunbarton.gov.uk/council-and-democracy/about-your-council/contact-us/ Read the blog, and let the silly Scots know that you are p*ss*d.
It's time to turn this around and make the dolts realize that the rope has 2 ends and we have a lot more pull than some shepherds and barley farmers.